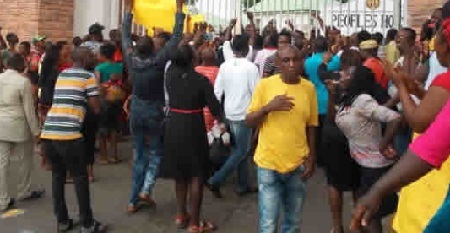 Scores of traders who were relocated to Industrial Cluster, Naze, after the demolition of Owerri main market by the state government, on Monday barricaded the Imo State Government House, Owerri, in protest. The embittered traders who blocked the main gate to the Government House caused panic in the area. They vowed not to vacate the entrance until Governor Rochas Okorocha addresses them. Brandishing various placards and singing, security men at the Government House, some of who bore arms, tried in vain to control the traders so as to allow free flow of traffic in and out of the compound. Addressing journalists, two of the protesting traders who identified themselves as John Okeke and Ebere Ndu, said the government sent them to the industrial market without first ensuring the success of their activities. Okeke said, “The government just sent us to the Naze Industrial Cluster, but we are suffering there. The traders said part of their grievances was that while the governor demolished Owerri main market and insisted that they move to the new site, the state government still allows other traders to continue trading in the demolished market. “They asked us to move to industrial cluster, we obeyed; but they allowed others to continue trading there. “As I speak to you, there is trading at the demolished Owerri main market, including street trading along the Douglas road. It wasn’t part of our agreement with the government,” Okeke said.